The Cancellation Policy (cancellationpolicy.asp) is displayed in a popup window and you can require the guest to acknowledge it before submitting the reservation. 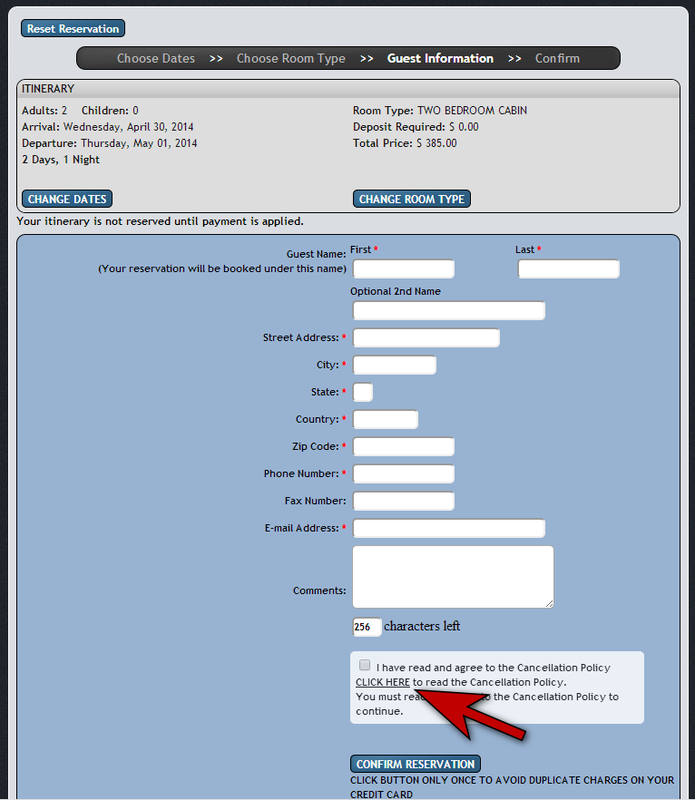 On the Guest Information page of the WebRes application, there is a highlighted section right above the Confirm Reservation button that has a checkbox that the guest must click to acknowledge and also provides a link so that the guest can view the Cancellation Policy. There is an additional variable that allows you to specify a custom file. If you do this, all editing is up to you. We only offer help for the file we provide. When the guest clicks the link, they will see the Cancellation Policy. The Cancellation Policy is a single file that can be edited with the HTML editor of your choice. This file is located in the WebRes folder. If you are experienced with modifying HTML, you are free to do anything you wish with the Cancellation Policy file. You CAN modify the numbers in "window.resizeTo()" so that they match the desired size of the Cancellation Policy window. You can also change the Title. Edit the Body in any way you see fit. It can be as simple or elaborate as you choose, including images, links, etc. Unless you are experienced with modifying HTML, do not remove the following code, which shows the "Close This Window" button and causes the window to close when clicked.